Want a challenge? Try building a Wi-Fi network for a car designed to break the speed of sound. Thanks to Steven Crowley, who dug through the FCC’s experimental radio applications, I got a chance to see what may be the fastest Wi-Fi network around. 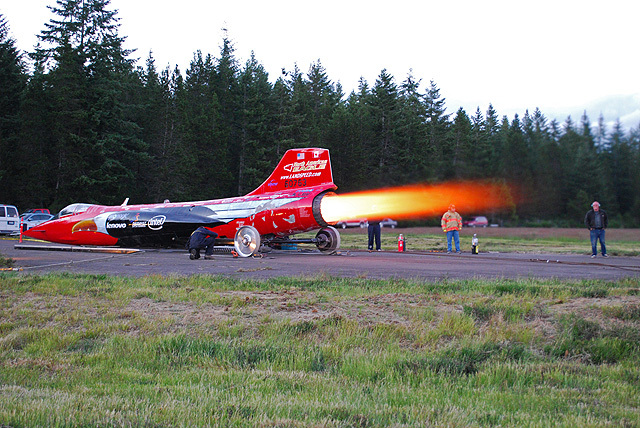 North American Eagle is using gear from Tropos to add Wi-Fi capability to a jet-powered car that’s designed to reach 800 miles per hour and break the current world record for speed in a land-based vehicle. So far, the site says the team has achieved half of their goal at about 400 miles per hour in the 56-foot long, 7-ton car. Check out the project, and prepare to view your current vehicle with scorn for a few days. Image courtesy of North American Eagle. Amazing wifi experiment shame about the car. The team who built thrust ssc the current record holder are building a 1000mph car called Bloodhound ssc….. 1000mph wifi, now that would be a challenge…..
No 4G carriers in the area?